growth and profitability across the enterprise,” said Abrams-Rivera. 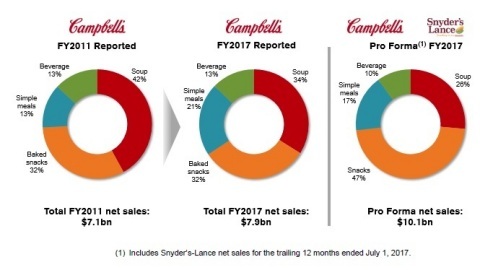 “The Campbell Snacks team will focus on optimizing the value of our U.S.
across the expanded snacks portfolio. Foley joined Campbell in 1999.
general manager for Arnott’s Malaysia & Singapore business. President, U.S. Sales and DSD Operations. with Snyder’s-Lance for the last seven years in business strategy. information technology, human resources and communications. Cod, Snack Factory Pretzel Crisps, Emerald and Late July. functions, including supply chain and quality, and finance. guidance when the company reports third-quarter earnings on May 18, 2018.